The Vietnam War (Vietnamese: Chiến tranh Việt Nam), also known as the Second Indochina War, and also known in Vietnam as the Resistance War Against America (Vietnamese: Kháng chiến chống Mỹ) or simply the American War, was a conflict that occurred in Vietnam, Laos, and Cambodia from 1 November 1955[A 1] to the fall of Saigon on 30 April 1975. It was the second of the Indochina Wars and was officially fought between North Vietnam and the government of South Vietnam. The North Vietnamese army was supported by the Soviet Union, China and other communist allies and the South Vietnamese army was supported by the United States, South Korea, Australia, Thailand and other anti-communist allies. The war is therefore considered a Cold War-era proxy war. The war is considered a humiliation for the United States. The Viet Cong (also known as the National Liberation Front, or NLF), a South Vietnamese communist common front aided by the North, fought a guerrilla war against anti-communist forces in the region, while the People’s Army of Vietnam, also known as the North Vietnamese Army (NVA), engaged in more conventional warfare, at times committing large units to battle. 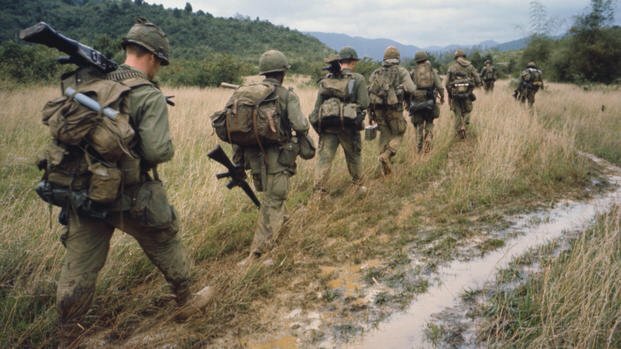 As the war continued, the military actions of the Viet Cong decreased as the role and engagement of the NVA grew. U.S. and South Vietnamese forces relied on air superiority and overwhelming firepower to conduct search and destroy operations, involving ground forces, artillery, and airstrikes. In the course of the war, the U.S. conducted a large-scale strategic bombing campaign against North Vietnam.